These are Trans* Jersey’s top tips for managing the change that your transition will create for those closest to you. They are drawn from business theories of managing change in the workplace but we think that they work for us, too. If you want to keep your personal relationships intact during your transition, you will need to expend some effort to do so. It isn’t enough to shrug and say that it’s up to your friends and family to just accept what you are telling them. It’s not fair to them to dump the news on their doorstep with no support to help them understand it. It’s a two-way process; it’s up to both you and them. Because gender dysphoria and transitioning is so poorly understood at present, you will need to be a bit of an educator as well as a manager of change within your “team”. Teaching may not be a skill that you currently possess but you can take a couple of short cuts. 1) Any teacher will tell you that lesson planning is a large part of the job. For us that simply means planning what we are going to say, when we are going to say it and to which audience we are going to say it. If you aren’t good at this, before any important conversation, write down what you want to say and don’t be embarrassed to use your notes. 2) Use the educational resources developed by others. Do your research to make it easy for you and those closest to you. Point your friends and family to websites, books, blogs, etc that do the educator’s job for you and don’t forget to follow up with them to allow them to ask you questions about what they’ve read. Act quickly, the longer the uncertainty lasts the worse people will feel. The anticipatory phase of change can cause anxiety and stress. 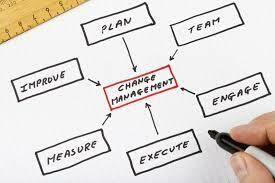 Communication needs to be built into the planning process for change right from the very start when you decide: the issues; objectives; audience; and message you want to communicate about your transition. Connecting with your team and laying the groundwork for open, honest discussions sets the stage for a connected and collaborative change. Ideally, this first phase needs to be done swiftly so that people hear the same message at the same time and do not hear about your transition through rumour. For more information about how to achieve this, see Trans* Jersey’s page on Transition Management. Involve stakeholders at the earliest stage in planning change. Your friends and family cannot realistically be involved in the healthcare aspects of your transition but you can involve them in all the social aspects. Thoroughly outline the details of your transition and communicate the high‑level types of changes that will be happening to you. Don’t lose people to “denial”. Involve them early and often to avoid some of the darker valleys of Fisher’s Transition Curve. Accept any advice they offer and, if it fits in with your plan, include it. If it doesn’t fit in with your plan, explain why. Don’t be bullied into compromising or changing your plan – you are the manager of your transition and you have the final say in how it will work. Tell the truth! It can be tempting to gloss over the more damaging impacts of change. Don’t compromise your truth to appease other people. It won’t work. You will be unhappy with a partial transition and they will never learn to fully accept your change. Change can be painful so don’t draw it out for those around you. Tell them you are transitioning and then do so! Build on positive feedback – some stakeholders may be relieved or even happy that something’s been done at last. There will be people in your life who always knew that you were different and will be thrilled that you have finally found a way to express that difference and be happy. These people are your champions – use them. Ask them to chat to other friends or family members who may be struggling with your news. Offer reassurance. Reassurance is really important. Your key messages may well be based on your immediate objectives for your transition. However, these can seem like a big step to someone who has not caught up to where you are in the process. Provide context for your transition that makes the changes taking place meaningful to individuals, such as talking about your childhood experiences of dysphoria with people who knew you then. Those people who love us are the ones who have invested the most in our lives. A lot of their fears and worries around our transition are going to be for our health and safety. Make sure that they know it is going to be okay, that you are getting the best advice you can and that you are taking sensible precautions to stay safe. Consult with stakeholders as soon as possible. Early warning of changes to your plan or new things that are happening to you during your transition can help people adjust. Hormone therapy, for example, is not an exact science. Everyone reacts differently. If your hormones are affecting you emotionally, let your friends and family know as soon as possible. Be clear and consistent about the message you are putting across. This refers to good “lesson planning” again. Plan important conversations well in advance. Don’t rush them. You may only get one opportunity to say what you need to say so it needs to be clear, concise and easily understood by the person receiving the news. Try to keep your important communications short and to the point. Don’t “kitchen sink”. People can only be expected to take in two or three key messages at a time. Think about the way you communicate. The more face-to-face communication you have with stakeholders the better. You may not be able to answer all questions during one session so consider using emails or newsletters to respond to queries. Always use plain English. Avoid jargon, it will only dilute your message and confuse your audience. See Trans* Jersey’s page on communicating assertively. Address personal concerns and give stakeholders the chance for questions – constructive criticism can be very positive! Questions are good. It means that your friends and family are engaging with your transition and want to know more. Try to be patient, open and honest with their inquiries. If there are questions that you do not feel comfortable answering, say so but make it clear that it is fine for them to ask any question they wish, you just reserve the right not to answer. Recognise how individuals feel. Taking regular “mood checks” on how people are feeling at different stages of the change will help you plan your communications strategy. Become a good listener and use the Transition Curve to help understand where people might be struggling with your transition. You should be able to work out what messages are not getting through or how to tackle any resistance to change. Be patient and try to help these people move on in their acceptance of the change. Rather than lecturing friends and family about how they should be feeling about your transition, a better tactic is to ask questions to get them to explore why they feel like that. Plan for stakeholders who cannot accept the changes and want to leave. Despite your best efforts, you may lose a friend or family member in the course of your transition. If you do, accept the loss of that relationship and allow yourself time to mourn that loss. Don’t expend energy on someone who refuses to take your journey with you. Let them go. You never know, they may realise that their life is poorer without you and come back in the future. Provide training where necessary for new duties or procedures. Again, this speaks to the need to educate those around us about our transition. This doesn’t only include the clinical facts about gender dysphoria, hormones and surgery, but also includes educating our friends and family about who we are and how we want to be treated by society now. Keep communicating. Don’t communicate for the sake of it but don’t be afraid to repeat your messages. Remember everyone will be at different stages in coming to terms with the change happening around them. See Trans* Jersey’s page on communicating assertively. Offer strong leadership and motivation. This is your transition and, if you don’t own it, nobody will. Be clear about what you want from it and stick to that goal. To keep your transition in a positive place, inform and educate your stakeholders about the benefits of your transition and the good things that are already coming from it. You want to build confidence. Being open and positive about it will attract support from many more people than just your friends and family for what you are doing. Being shy or, worse, embarrassed and ashamed of your transition will provoke the same reaction in others. Everyone likes to be associated with success so you need to put in the work to ensure that your transition is the success you want it to be. Inspire them by helping them to visualize the future and their new role in your life! Provide counselling where appropriate. For those people struggling with your transition, suggest that they go and see their GP to get a recommendation for a few counselling sessions to help them process the change that is happening. Be prepared to have this suggestion rejected – some people still have a stigma about going to see a counsellor – but make the offer none the less. The counsellor doesn’t need to be a gender specialist. Coping with change is within the remit of most psychologists. Your friend or family member should be able to get this counselling covered by their medical insurance or through the Jersey health service. Set up a working group to work on specific problem areas. Where you encounter resistance to your transition, recruit your champions to help you. Ask them for their advice on how to approach the person who is resistant, ask them if they will have a chat to the resistant person for you to find out what might be bothering them, or ask them to accompany you as a mediator for your conversation with the person who is resistant. Involve stakeholders in reviewing ongoing changes. There are lots of mini-milestones in transitioning where you can involve other people. Friends and family may feel honoured and, therefore, more invested if they are asked to be included at a moment that has significance for you. For example, ask them for their input when you go shopping for new clothes, MtFs might ask female friends and relatives for make-up advice, FtMs might ask male friends and relatives for tips on how to “talk sports”, take a friend or family member with you when you change your name or get your new documents, etc. Celebrate successes. About a year into your transition, you will know who your supporters are and the hard work of managing your friends and family’s reaction to your transition should be behind you so make sure that you do something to thank them, maybe have a “transition anniversary” party or send everyone a personalised card thanking them for their support. Your friends and family will appreciate the gesture and it will be a way of marking the end of your role as the change manager for your “team”.